One of the fundamental duties of the federal government is to "provide for the common defense." As a member of the House Armed Services Committee (HASC), I work every day to ensure we take that duty seriously and that the members of our Armed Forces are supported as they do the difficult job we ask them to do. Last week, the HASC advanced the major bill through which Congress provides for the defense of our nation. 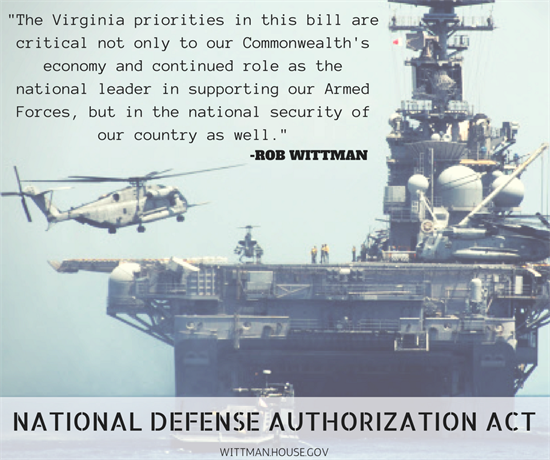 This bill, the National Defense Authorization Act (NDAA), equips, supplies, and trains our troops; cares for them and their families; and sets national security policy in a dangerous world. The main focus of this year's bill was closing the readiness gap resulting from several years of steep defense spending cuts; cuts that have devastated our military's ability to plan, train, equip, and maintain our force. Specifically, this year's bill calls for base budget requirements of $631.5 billion, including more than $25 billion dedicated to military readiness. * Maintains our commitment to the B-21 Raider program. The Seapower provisions in this NDAA take the first steps towards restoring our military readiness and giving our Navy, Marine Corps, and Air Force the tools and resources they need to deter our adversaries, support our allies, and respond to threats around the globe. * Langley Air Force Base: Encourages the Chief of Staff of the Air Force to ensure that CAOC-X and other regional CAOCs (like Langley) are resourced, manned, and fully utilized to serve as a training venue for the planning, execution, and command and control of joint forces taking part in major regional joint exercises. * George P. Coleman Memorial Bridge, Yorktown, VA: Requests a briefing from the DoD on the military value of the Coleman Bridge's swingspan, to include a discussion with local and State stakeholders that have financial responsibility for the management of the bridge. * The Domestic Maritime Centers of Excellence Act, legislation I recently introduced , was added as an amendment to the NDAA. The bill advances the capabilities of two-year community and technical colleges to assist the federal government and industry in securing the talent pipeline for domestic maritime industry jobs, which will mean more shipbuilders and repairmen to sustain and expand trade and grow our Navy's Fleet. * Improvement of the U.S. Navy's public shipyards, like Norfolk Naval Shipyard, in the areas of personnel and infrastructure. Now that it has passed the Armed Services Committee, the NDAA can be brought to the House floor for a vote. I will continue to promote these local priorities, and the Seapower-specific provisions, as the bill moves through the legislative process.